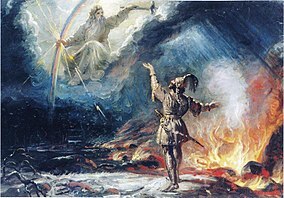 Painting by Robert Ekman in 1867 called Lemminkäinen tulisella järvellä where Lemminkäinen asks help from Ukko ylijumala with crossing the lake in fire on his route to Pohjolan häät. Ukonkivi (English: Ukko's rock) in the lake Inari in Lapland. Ukonkivi was a holy site to the local Sami. Archeological finds, apparently offerings, have been found at site. Ukko, or Äijä or Äijö (Finnish: male grandparent, grandfather, old man), parallel to Uku in Estonian mythology, is the god of the sky, weather, harvest and thunder in Finnish mythology. Ukkonen, the Finnish word for thunder is the diminutive form of the name Ukko. [note 1] [note 2] Some researchers believe that Ilmarinen, another Finnic sky god, is the origin of Ukko, while some others believe that Ukko's original name was Baltic Perkele. Ukko is held the most significant god of Finnish mythology, although it is disputed by scholars whether this is accountable to later Christian influence. In the folk poems and prayers he is also given the epithet Ylijumala (English: Supreme God), probably in reference to his status as the most highly regarded god and on the other hand his traditional domain in the heavens. Other names for Ukko include Pitkänen (pitkä, "long"), Isäinen (isä, "father"), Isoinen (iso, archaic form of the above, modern meaning "great"). Although portrayed active in myth, Ukko makes all his appearances in legend solely by natural phenomena when appealed to. According to Martti Haavio, the name Ukko was sometimes used as a common noun or generalised epithet for multiple deities instead of denoting a specific god. Pre-Christian pendants associated with gods of thunder. A) "Finnish type", B) "Swedish type", C) "Wolf's cross". Corded Ware culture boat-shaped battle axe from Närke, Sweden. It is likely that the figure of Ukko is mostly Indo-European, possibly Baltic, in origin. Ukko is held by researchers of religion to be parallel to Indo-European patriarchal sky deities, for example to Zeus and Jupiter of the Classical Greco-Roman pantheon, the Indian Hindu god Indra and the Norse god Thor. Tuuri, a Germanic loan and cognate of Thor, was possibly an alternate name for Ukko. Tuuri is rarely encountered in Finnish mythology, and had been relegated to the mere role of deity of harvest and success. It is possible that when Ukko took the position of the preceding sky god Ilmarinen, Ilmarinen's destiny was to become a mortal smith-hero. Stories tell about Ilmarinen vaulting the sky-dome. Whether Ilmarinen was an earlier, assumably Uralic sky deity is regardless highly questionable. Some researchers hold Ilmarinen and Ukko equivalent. The Sami worshipped a similar deity, called Aijeke, probably as result of cultural cross-contamination or common origin. The god was equated with Horagalles. Simplified drawing of a stone carving type found in Karelia, which is believed to have characteristics of both snake and thunder. Ukko possessed a weapon, often a hammer called Ukonvasara (English: Ukko's hammer), sometimes also an axe (Finnish: Ukonkirves) or a sword, by which he struck lightning (see thunderbolt). Ukko's weapon was largely comparable to the Norse Mjölnir, and Iron Age emblematic pendants depicting hammers and axes similar or identical to Scandinavian specimens have been unearthed in Finland. 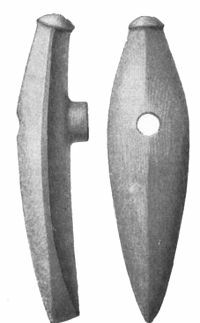 Like Mjölnir, Ukko's weapon has been linked by some to the boat-shaped battle axes [de] of the Corded Ware culture. Thunderstorms were sometimes interpreted as result of Ukko copulating with his wife Akka (Finnish: Old woman). He also was believed to cause thunderstorms by driving his chariot through the skies. A viper with a serrated line on its back was considered a symbol of thunder. Neolithic stone carvings have been found in Russian Karelia which have features of both snakes and lightning. It is, however, uncertain whether these are directly connected to the figure of Ukko. Evidence for worship of snakes is found among different cultures around the Baltic, amongst them Estonians and Finns. There is evidence that the rowan tree was held sacred to Ukko. Rauni, a vaguely defined being has been hypothesised to be cognate to Germanic words for the rowan tree through Old Norse *raunir. The ladybird was also considered sacred to Ukko and called ukonlehmä (English: Ukko's cow). Before the advent of Christianity, the Midsummer festival in Finland, today known as Juhannus after John the Baptist (Finnish: Johannes Kastaja), was held in honor of Ukko and called Ukon juhla (English: Festival of Ukko). This tradition carried to the 19th century. Also dedicated to Ukko were the Vakkajuhlat (English: Vakka festival) also known as Ukon vakat (Ukko's vakkas) or simply vakat (Vakkas). Vakkas were commonly held in May coinciding with the spring sowing. During vakkas it was customary to consume or otherwise offer a container or some other vessel (Finnish: vakka) of an alcoholic beverage or food as sacrifice. It appears that often the festival was held in the community's sacred grove or hiisi where an animal sacrifice was sometimes also performed as part of the same festival. This ceremony was believed to guarantee good weather for the coming year and thus a good harvest. It appears that the vakka tradition was rather lively. The last uncontested reports of vakkas being held originate in the 19th century, although sporadic reports also surface in the 20th century. The festival is also mentioned by the Finnish reformer Mikael Agricola in his account of what from his point of view was Finnish idolatry. A number of toponyms in Finland and surrounding regions contain some form of the name Ukko. It is possible that during and after the Christianisation of Finland, the figure of Ukko became conflated with that of the Christian deity. It has been suggested that this was in part because of the relative similarity between the deities. The Weather Channel list of winter storms for 2012 list Ukko as one of the alphabetic names they used. ^ Compare to English thunder (< Old English þunor) and German donner (< Old High German donar) both derived from Proto-Germanic *þunraz and originally synonymic with appellations of the thunder god. ^ In Finnish, diminutive formations do not carry the same pejorative or belittling connotations they do in some other languages, e.g. Latin. ^ Suomen sanojen alkuperä. Helsinki: SKS. 2000. ISBN 951-717-712-7. ^ "Äijät ja ämmät, vaarit ja muorit. Isovanhempien nimitykset suomen murteissa". Retrieved 2015-12-25. ^ Haavio, Martti (1967). Suomalainen mytologia. Porvoo Helsinki: WSOY. ^ Salo, Unto (1990). Agricola's Ukko in the light of archeology. A chronological and interpretative study of ancient Finnish religion: Old Norse and Finnish religions and cultic place-names. Turku. ISBN 951-649-695-4. ^ Salo, Unto (2006). Ukko: The God of Thunder of the Ancient Finns And His Indo-european Family. Inst for the Study of Man. ISBN 978-0941694940. ^ Siikala, Anna-Leena (2013). Itämerensuomalaisten mytologia. Helsinki: SKS. ^ Haavio, Martti (1959). Karjalan jumalat. Porvoo: WSOY. ^ Virrankoski, Pentti (2009). Suomen historia 1&2. Helsinki: SKS. ISBN 978-952-222-160-5. ^ Елисеев Ю. С. Древнейший письменный памятник одного из прибалтийско-финских языков.— Изв. АН СССР. Отд-ние лит. и языка, 1959, т. 18, Вып. 1, с. 65—72. ^ Haavio, Martti (1967). Suomalainen mytologia. Porvoo, Helsinki: WSOY. ^ "Juhannus, mittumaari, vuotuisjuhlista vehrein". Archived from the original on 2012-03-16. Retrieved 2012-07-18. This page was last edited on 20 March 2019, at 07:27 (UTC).